LONDON--(BUSINESS WIRE)--Infiniti Research, a global market and customer intelligence solutions provider, has announced the completion of their new market opportunity assessment study on the CPG industry. 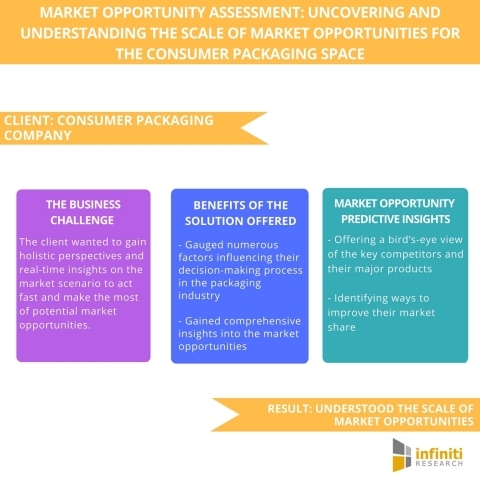 A global consumer packaging company wanted to get holistic perspectives and real-time insights on the market situation to act fast and make the most of potential market opportunities. Request for a Proposal to see how Infiniti Research’s solutions can help you. Current developments in the packaging industry have formed a high demand for packaging materials such as pouches, foils, and cling wraps. But, striking the right balance between the functionality of the package and sophistication is the main challenge for players in the consumer packaging sector. Packing industry companies are now concentrating on developing innovative packages that are intended at enticing customers to drive sales. At the same time, they are looking at developing solutions that meet the toughness and functionality requirements. The market opportunity assessment solution presented by Infiniti helped the client to find market risks and opportunities and attain a detailed understanding of the market prior to expanding the business. The client was also able to build detailed business plans and strategies. The client wanted to identify market risks and opportunities and gain a detailed understanding of the market prior to expanding the business.